I believe salt has a healing power because as a child I remember my mum treating all infections with warm salty water, from tooth infections to a graze. Also in the Caribbean if you’re not well no matter the ailment locals always tell you to ‘go bathe yourself in the sea it will heal you’, so I always go for a swim in the sea to reduce my post eight-hour flight swollen ankles and I swear that’s due to the salt water (really, give it a go it works a treat). Salt is a mineral composed primarily of sodium chloride (NaCl), a chemical compound belonging to the larger class of salts, it is an essential nutrient but is something that the body cannot produce itself – maybe that’s why we tend to crave it? Needless to say, it is an obvious choice of ingredient for certain body care products too. For starters, it’s a great exfoliant, especially when mixed with essential oils. I love a good body scrub especially before, definitely during and essentially after beach holidays – helps my tan last longer without any nasty peeling – but weekly exfoliation is something to keep up all year round. Elemis Frangipani Monoi Salt Glow & Elemis Lime and Ginger Salt Glow. As with nearly all Elemis products face or body they truly make me feel like I’m at a spa. Both these exfoliants aim to deep cleanse leaving the skin soft and nourished. Dr Salts Epsom Salts with Black Pepper. Epsom Salts (is another thing I used to hear my mother’s generation mention a lot) isn’t technically a ‘salt’. It is a pure mineral compound of magnesium sulphate in crystal form so it looks like salt but it has no sodium chloride – I’m not stressing over the technicalities though. Never really knew of its benefits but if you look around your supermarket you’ll start to notice it everywhere. Discovered in Epsom, Surrey, UK, these salts have provided medical and therapeutic benefits for generations. 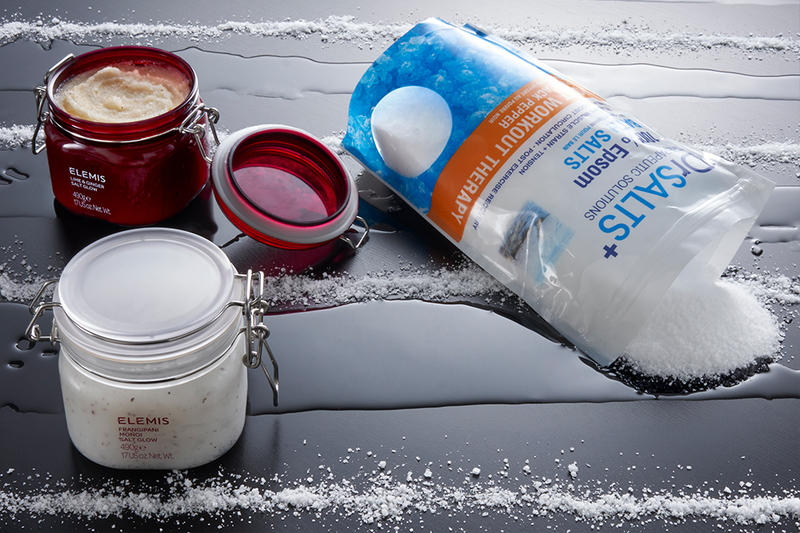 For muscular tension and reduce inflammation of muscles, Epsom Salts are brilliant after a gym session. Marathon training? I’d advice you to stock up. 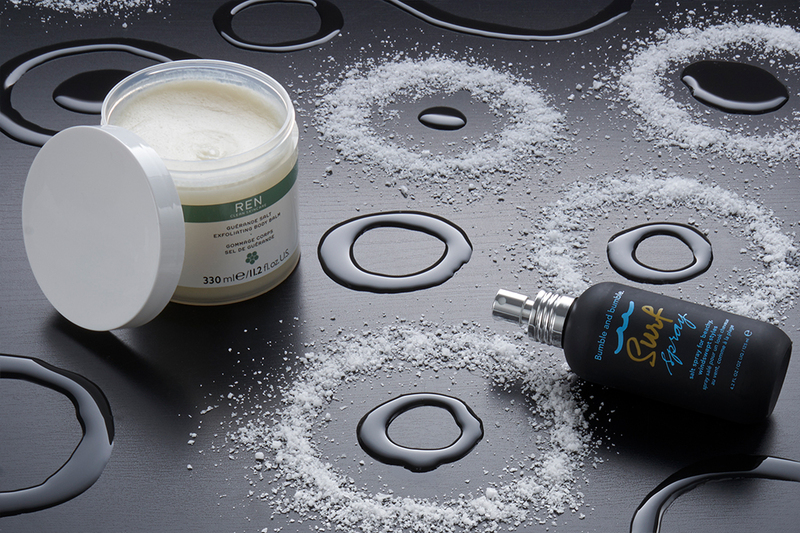 Ren Guerande Salt Exfoliating Body Balm. As you may know, I love a balm any balm and Ren’s Body Balm energises and hydrates the skin, leaving it feeling moisturised and renewed. Bumble and Bumble Surf Spray is every hairdresser’s first choice for bed head hair, lived in hair, too squeaky clean hair and for adding body to fine hair. I’m not sure if Bumble and Bumble were the first ever brand to launch a salty spray but I definitely remember hairdressers singing “Hallelujah” now that they no longer had to make their own. The sulphurous waters of the Dead Sea possess extraordinary qualities and rich health-giving minerals; sulphur, iodine, magnesium, potassium, calcium, sodium. The combination of these minerals has helped to relieve skin complaints such as eczema, psoriasis and acne, as well as stimulating blood circulation and cell rejuvenation by immersing themselves in the therapeutic waters. 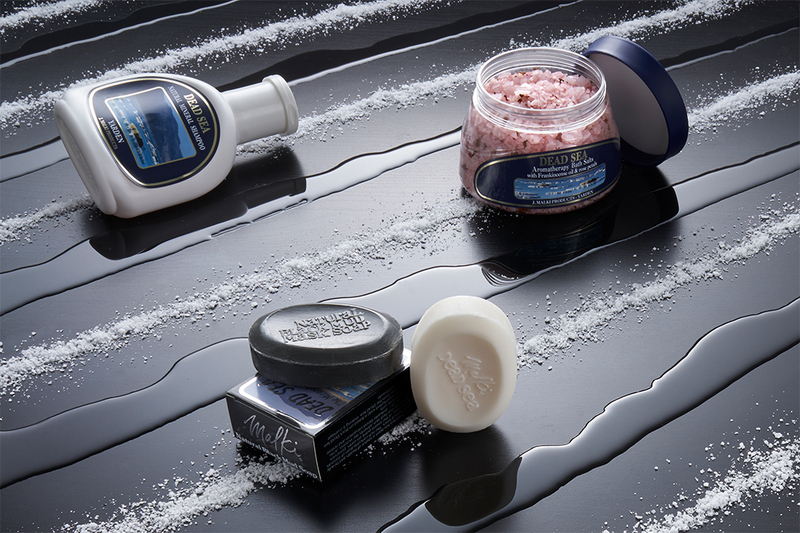 The minerals of the Dead Sea form the basis of Malki Dead Sea products.